Imagine it is November 18, 1881, and you are standing at 84, boulevard de Rochechouart, just below Montmartre, in the cold of night. You hear a commotion in the distance and the sound of drunken singing. Flames light the sky. A torch-lit procession is heading your way! At its head is a burly Swiss Guard in full regalia, wearing a rather splendid plumed hat and holding a halberd; in tow are a band of young men celebrating with wine and song. You are witnessing the birth of the most famous cabaret in Paris. 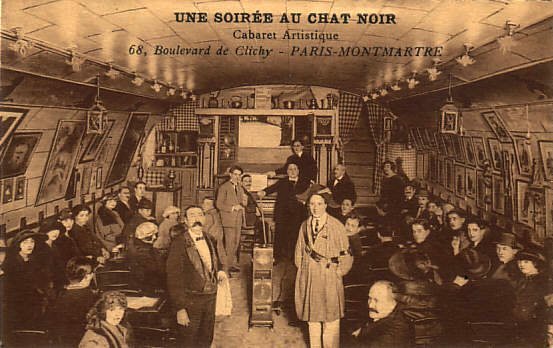 In Chapter 18 of Paris by Plaque, we explore the history of Le Chat Noir cabaret. The translation of the Histoire de Paris plaque, which was installed at 84, boulevard de Rochechouart 112 years later, notes a group of radical young writers and artists called Les Hydropathes (“those who are afraid of water”), led by the journalist Emile Goudeau. Like many young men, they were indeed averse to water, preferring wine and beer in volume. 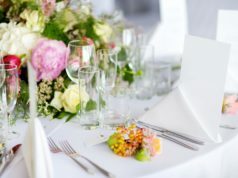 Goudeau’s club, which met in his house on the Left Bank, had become so popular and so energetic that it outgrew its meeting place and the group began a search of new premises. 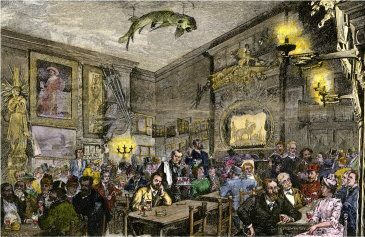 Artist Rodolphe Salis had just acquired a new cabaret, which was in need of livening up, so he invited Goudeau’s friends to join him. 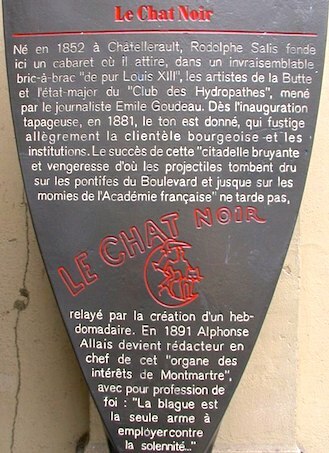 The torch-lit procession heralded the crossing of the Seine and the real beginning of Le Chat Noir—The Black Cat Cabaret. In its early days Le Chat Noir was simply the most exciting place to be for an emerging artist. The entertainment was totally spontaneous and chaotic. Poets, writers, musicians and singers would just jump to their feet and perform for their peers, receiving instant and sometimes sarcastic feedback on their work. It was what we would today call an “open stage.” Although their critics could be harsh, performers and artists learned much from their peers, and were encouraged and nurtured respectfully too. Some great talents emerged. Rodolphe Salis was an eccentric showman. His fondness for processions continued. He once greeted his patrons at the door with the announcement of his own death, and went on to lead his funeral procession through the streets of Montmartre to drum up publicity. The Swiss Guard became a permanent fixture, and the interior was flamboyantly decorated with a mish-mash of heavy antique furniture, lamps and paintings, to give a Louis XIII ambience. Performers were never paid, except in free beer and absinthe, and Salis was accused of making money from the work of others as the club became more and more successful. Some regulars became disgruntled about the emphasis on commerce over art. The club became so popular that two more moves followed, first to rue Laval (now rue Victor Massey) and finally to 68, boulevard de Clichy, where it remained. Salis produced a magazine, with patrons contributing the satirical content, cartoons and artwork. One of the cleverest moves Salis made was to commission the Art Nouveau artist Théophile Steinlen to design a sign and posters for the cabaret. Finding a stray black cat during the renovation of the site, Salis hit upon the name and the scraggy feline became the perfect emblem for wild and edgy cabaret nightlife. 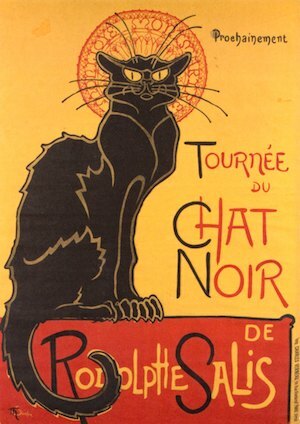 Steinlen’s famous poster, La tournée du Chat Noir avec Rodolphe Salis, remains one of the most evocative images to come out of nineteenth-century Paris. It advertises a tour of the Chat Noir’s Théâtre d’ombres, or Shadow Theatre, which gained huge popularity. Steinlen and artists like caricaturist Adolphe Willette, cartoonist Caran d’Ache, Henri Rivière and illustrator George Auriol created an exquisite art form, using sheets of zinc to cut out shapes and characters that created shadows on a white screen, backlit with electric lamps. The writers in the club wrote the plays, Salis the showman narrated them, and the whole of Paris was entranced. The Théâtre d’ombres ran for eleven years, with a repertoire of 40 plays. You can still see some of the surviving zinc cut-outs at the Musée de Montmartre. Soon the bourgeoisie began to drop in to find out what all the gossip was about, although they were not spared the acid tongue of the two conférenciers (emcees) Salis and cabaret singer Aristide Bruand, who were notoriously rude to their guests, insulting them if they left early and banishing them to a corner if they arrived late. Left: ad for Le Chat Noir. 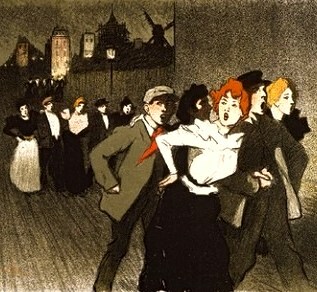 Right: Le Chat Noir patrons depicted by Toulouse-Lautrec. 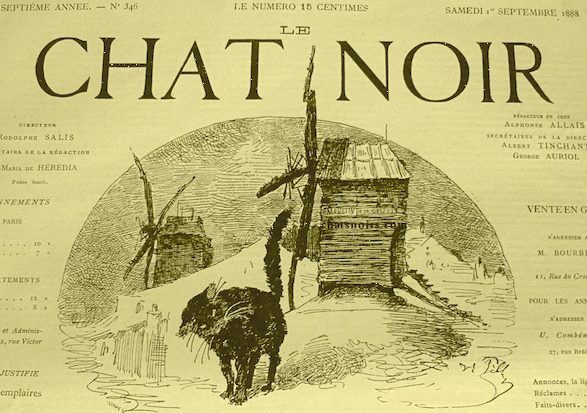 Over time Le Chat Noir became host to groundbreaking writers, poets, artists and musicians. Poet Paul Verlaine wrote poetry with an inkbottle on his table and composer Erik Satie was the house pianist for a while. The list of brilliant creative minds who gathered there is astonishing: caricaturist André Gill, composer Claude Debussy, famous Can-Can dancer Jane Avril immortalized in Toulouse-Lautrec paintings, humor writer Alphonse Allais, Paul Signac, who developed the Pointillism style of painting with Georges Seurat, cabaret singer and actress Yvette Guilbert and playwright August Strindberg, to name just a few. It is not surprising that Le Chat Noir symbolizes the very essence of artistic Paris for so many people around the world. The cabaret closed in 1897, and Salis died in the same year. It was the end of an extraordinary era. 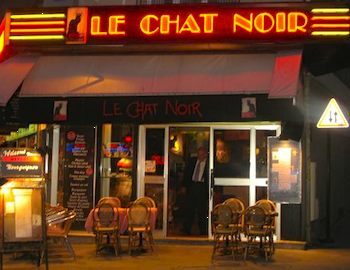 Today a Le Chat Noir neon sign can be seen at a hotel located at 68, boulevard de Clichy, the cabaret’s final address, but that’s not where you’ll find the plaque. Photo credits: all are public domain images except Le Chat Noir sign at Paris hotel is from Wikimedia Commons. Would you happen to know where to purchase a print of the orange/teal ad? 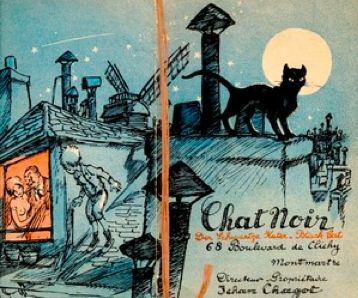 Hi, do you know anything more about the provenance and/or date of the blue-toned ad for the Chat Noir featuring a black cat on the rooftops and a cheeky child looking into an attic window?